1．What is Thunderbolt Next Generation Interface Technology? Thunderbolt is a standard high-speed data transmission cable jointly developed by Apple Inc. and Intel Corporation. The Thunderbolt protocols are PCI Express for the data transfer technology and Display Port for video output, which is compatible with a dual-protocol solution. The Thunderbolt connector is a Mini Display Port, and commonly provided for liquid crystal displays. Based on Intel’s technical specifications, Sumitomo Electric has recently developed the optical Thunderbolt cable by integrating our advanced cable technology and high-speed transmission technology. Following this success, we obtained Intel's official certification for the first time in the world. 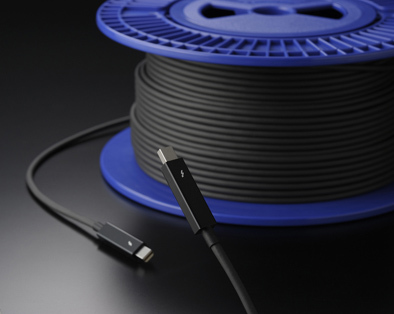 Optical Thunderbolt Cable is released in December 2012, further supporting the market needs for long-distance high-speed transmission connectivity. This advanced interface technology has the potential to dramatically improving your PC and peripherals environment; by using Thunderbolt technology. Thunderbolt technology is an innovative interface with the following features. 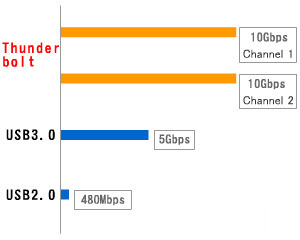 The key feature is the maximum 10 Gbps bi-directional transfer speed. This far exceeds by more than 20 times faster performance the current popular USB 2.0, and is more than two times faster compared with USB 3.0, which is said to be a leading-edge technology. In a conventional cable interface when many beautiful HD images stored on the hard disk are selected in the thumbnail view the pictures play back slowly, but now switching still- images like picture cards using a high speed interface show that Thunderbolt will resolve such problems. Thunderbolt technology has the potential to enhance the user experience. The following is 10Gbps transmission properties evaluation. Eye Patterns *1 show an electrical characteristic. 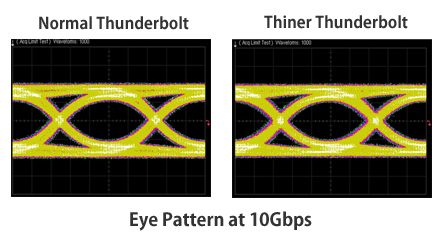 *1 Eye Pattern evaluation is often used for high-speed transmission cables. With Thiner Thunderbolt, tansmission properties do not change, because of the strong signal wave pattern correction technology built in a plug. Thunderbolt brings a stress-free environment for enormous data editing such as video edtting by the high-speed data transmission technology that achieves transmission speed over 1Gbyte/sec. *1: PC and the 4-Bay RAID support Thunderbolt2. *2: The result is based on averages from an experiment using three samples of Normal and Thinner type. The Thunderbolt technology integrates PCI Express for data transfer technology and Display Port for video output technology. The small Mini Display Port connector is capable of providing data transfer, monitor output, and a power supply all at the same time. Thunderbolt has the power supply capacity up to 10W (*USB 2.0 is 2.5 W) and enables stable operation of mobile peripherals without an external power supply. You will be able to enjoy Thunderbolt's high-speed performance outdoors. Thunderbolt allows for the daisy chaining of peripherals, and simplifies the interface cabling when using multiple devices. 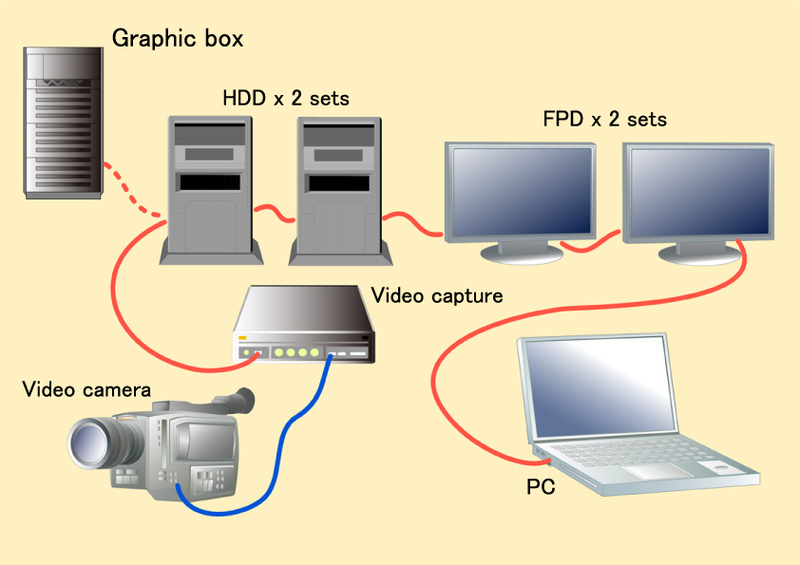 For example, if you wish to connect a PC, display, and storage, you can connect a cable from the PC to the display and from the display to an external storage device. If the peripheral devices are increased, a complex port branch is not required. Thunderbolt now makes it possible to connect a single cable to a PC and peripheral devices, such as a display and HDDs by daisy chaining up to six devices. When using our high-speed PC connection technology, Thunderbolt delivers significant working efficiency. In particular, the most profound effect is to be expected in video editing field and related work. There are even more possibilities for Thunderbolt technology. The greatest benefit is that there are no boundaries between internal and external devices by integrating the external devices to PCI Express, and it provides the same level of performance for peripherals and built-in devices. In other words, the user can transform their mobile computer into a high-performance computer or high-performance game machine by connecting to a wide variety of peripheral devices via Thunderbolt. This is a versatile interface that the user can apply in various ways depending on their needs; that is Thunderbolt technology. In addition, Sumitomo Electric released the Optical Thunderbolt Cable that combines optical fiber and optical module technologies in December 2012. This product enables longer distance transmission than metal cables by the conversion of the electrical signals into optical signals in the connectors of both terminals. Currently, a product line-up of new cables up to 30m is planned. Optical Thunderbolt Cable strength and robustness, that withstands the consumer environment, is achieved using our proprietary optical fiber development technologies. The Optical Thunderbolt Cable diameter is 4.2 mm, the same as Thunderbolt, and functional performance is excellent. As the Thunderbolt products continue to evolve and grow, users should look forward to the great potential of this next-generation interface technology. Transfer HD footage that has been shot with a video camera from the video device storage to HDD (*HDMI between the camera and capture). Connect the video device storage and the external graphics boxes to improve video processing performance by connecting two Thunderbolt high-speed cables to high-capacity HDDs along with two high-resolution monitors to comfortably edit HD video in a spacious work area. Realize efficient video editing by using 10 Gbps high-speed data transmission. Improve simplicity of the wiring interface between the PC and peripherals. Easy expansion of HDDs with a daisy-chain cable. *The delivery area of coverage is strictly within Japan. Thunderbolt and Thunderbolt logo are trademarks or registered trademarks of Intel Corporation.